Roman Polanski once called Los Angeles the most beautiful city in the world, when seen from a distance and at night. While there's a certain amount of tongue-in-cheek shade being thrown here, he's not wrong. The vantage point in question was none other than his friend and collaborator Jack Nicholson's house, auspiciously perched atop the winding and treacherous Mulholland Drive. Even if you've never been west of the Mississippi in your life, you know this view. It's been used in so many movies and television shows that's it's practically ingrained in the collective American subconscious. That sprawling, awe-inspiring, jaw-dropping view, that grid of twinkling lights spreading out to the horizon, with the headlands of the Palos Verdes Peninsula just barely visible in the distance. If you're lucky, you could see the sea (if you could see it). The view from Mulholland Drive symbolizes all of the inherent hope, promise, excess, deception, and despair that the City of Angels represents. Love it or hate it, whether you've been there or not, Los Angeles is the city of American dreams. And nightmares. Often intertwined. Often indistinguishable. 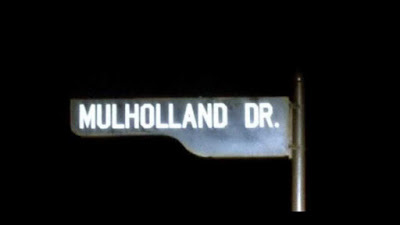 And David Lynch's 2001 neo-noir crown jewel Mulholland Drive is the best film ever made to capture that paradox. A schizophrenic fever dream. A surrealist mindfuck. A Salvador Dali painting come to life, wrapped up in the bloody gauze of a film noir crime caper. Mulholland Drive is cerebral, nonlinear, lusciously beautiful and entrancing, yet often hideous and terrifying. On the surface, it's an engrossing old-school mystery of amnesia and mistaken identity, set against the eerie dreamscape of Hollywood stardom and its seedy underbelly. Naomi Watts turns in the best acting performance of the 21st century (yes, I said it) in her role as Betty, a hopelessly naive Hollywood ingenue, fresh off the plane from small-town Ontario, staying in her aunt's apartment while she hopes for her big break as an actress. Yet before she can even unpack her suitcases, she finds the voluptuous and enigmatic "Rita" (Laura Harring, stepping straight off a pin-up poster from the 1950s and looking absolutely stunning) cowering in her shower, terrified and unable to remember her own name. All she can remember is a violent limousine car crash up on Mulholland Drive the night before. Together, they set out together like two Nancy Drews, to find out who "Rita" truly is, and why her pocketbook is filled with cash and a mysterious blue key. However, any similarity to a typical "plot" ends there. A mysterious albino cowboy issues ominous threats to a dogged film director, whose latest production appears to have inexplicably been taken over by the mafia. A hideous monster lurks behind a diner. A hapless hitman bumbles his way through a job to recover an address book. A dwarf in a wheelchair may or may not be pulling the strings from a darkened room behind a glass door. What does any of this have to do with Betty and Rita? Are Betty and Rita even real? Are Betty and Rita possibly the same person? Everything. Nothing. Yes. No. Maybe. All of these answers are correct. Not only is this film one of the most dreamlike ever captured on screen, it may even benefit you to ask whether anything onscreen is actually happening at all--is any of this real? Is it all just a dream? The characters often appear to sleepwalk through their surroundings, exaggerating their lines and leaving pregnant pauses before reacting. The plot jumps around, sometimes maddeningly, but never without purpose. Entire scenes and characters seem to come and go without explanation. Just like a real dream, characters change identities, and it vacillates between fantasy, comedy, and nightmare, switching from one to the other without warning. It's jarring, and it's challenging. Mulholland Drive is divisive and not without its detractors. It can be described as the definition of a "love it or hate it" film, and very few who watch it fall in the middle of the spectrum, saying it's "decent" or "just okay" or "not that great." Of those of you who watch this, half of you will thank me for introducing me to one of your new favorite films. Half of you will curse me out for wasting your time, and possibly never read another review of mine again. But I guarantee that none of you will walk away unaffected. 1) Consider that much, if not all, of what you are watching, may in fact be an actual dream. 2) Treat this as a mystery, but the mystery is NOT to solve what's happening to the characters. It's to decipher is what the film is trying to tell you. Like the best art, it means different things to different people, even to the same person (like myself) at different times. For the love of God, don't do yourself a disservice by skipping this. Rush out and see it as soon as you can.